Considered the last great Powell/Pressburger film by modern appraisers -- The Battle of the River Plate enjoyed a rapturous reception upon its release and was the collaborators' third-most profitable film -- The Tales of Hoffmann marked the duo's most ambitious project yet. Michael Powell always sought to combine the various arts into the cinema, into the "composed film," and he'd made significant strides with his masterpiece, The Red Shoes, which combined his cinematic form and his usual painterly touches with magisterial architecture, music and dance. Hoffmann, as an adaptation of an opera, seeks to incorporate that mix of five of the seven arts with literature, as operas come with librettos. As for sculpture, well, that depends on how poetically one wishes to discuss staging. As with The Red Shoes, Powell is not content merely to reproduce his artform-within-an-artform merely as a simple adaptation of stage to screen. The dance sequence in the Archers' ballet film blended the effervescence of dance with the magic of cinema, rooting the action on a stage yet jutting off in directions that reality could not follow. That blend of the old style of design -- cut-outs and well-chosen colors and lighting -- with the freedom of cinema is what makes that film, and this one, so amazing. The Tales of Hoffmann at no point breaks from Jacques Offenbach's opera (though Powell does omit some details and plot lines of the original), to the point that its sets are blatantly constructed (some are even surrealistic, influenced by such artists as Joan Miró). Yet Powell and Pressburger make this spare presentation into something so far beyond the original theatrical adaptations, those pictures that simply transplanted Shakespeare et al. to the screen with nary a hint of visual imagination, that it looks more vibrant and tangible than the most ambitious operatic films that followed. 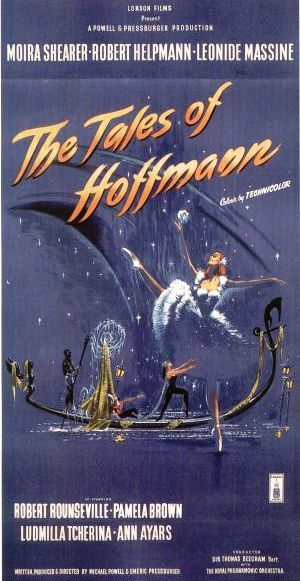 Artifice plays a huge role in The Tales of Hoffmann, from its opening synchronization of rotating weather vanes with the first strains of the score to a shot of actors revolving in a gilded gazebo as if in a giant music box to three separate shots of the playbill that introduces each of the three acts with a brief synopsis and the dramatis personae. One of its final shots shows the orchestra's conductor, Sir Thomas Beecham, guiding the film's music. Visually, Powell uses a number of camera techniques that call attention to themselves, such as overprinting and jump cuts. Indeed, the tales of the titular Hoffmann, which begin after a drunken revel in a tavern, seem almost an afterthought, in the best possible sense. Powell pulls out all the stops from the start, moving from the opening credits and the start of the music to a transcendent sequence known as the Dragonfly Dance, a setpiece from a ballet within the opera. In it, the ballerina Stella (Moira Shearer) dances like a maniac as Count Lindorf (Robert Helpmann, who looks every bit as if he just walked off a German expressionist film) watches with a mixture of lust and malice -- this will factor into the story later. The Dragonfly Dance, an explosion of ecstasy so light that it ends with Shearer seemingly bounding upon lily pads and leaves, is no less impressive a feat than the dynamic sequence in The Red Shoes. It's so good that one wonders why Powell would place it at the start. Maybe he didn't want to bury the lede, as it were, but where else can he go from there? It all makes sense, though, once Act I begins, as Hoffmann recounts the first of his three epic, tragic romances. Act I occurs within an obviously staged set draped in brilliant yellow, creating a light, frothy mood enhanced by the bubbly music. Hoffmann arrives to find a scientist, Spalanzani (Léonide Massine) having created Olympia (Shearer again), a dancing doll who twirls and leaps when wound up. Another scientist, Coppelius (Helpmann a second time, even more Germanic and expressionistic than the last) sells Hoffmann a pair of magic glasses that make Olympia seem real, as Spalanzani sets off the robotic girl into her dance. Much of this first act plays out humorously, with Olympia dancing frenetically until her gears slow down, only to be wound once more by the deceitful scientists. However, in context of the Dragonfly Dance sequence, Olympia's constant wavering between movement and immobility visualizes a complexity behind what might have been a simple setpiece: after watching Shearer dance so majestically and yet so fiercely from the start, seeing her "powered down" produces a cognitive dissonance. Powell heightens the effect by filming her almost exclusively in long shot so that, when Coppelius learns that his colleague tricked him out of the profits and returns to dismember the doll, the moment is even more shocking. Coppelius rips apart everything but a leg, which continues to dance, a touch that brings the contradictions of the doll to a close by giving us a Shearer who dances even in death. It also builds upon the Dragonfly Dance by showing the degree to which a male character (invariably played by Helpmann) either subtly or openly controls the female in each segment and brings about her ruination. That Olympia is a dancing doll instead of a singing one, as per the opera, advances this underlying theme by showing Helpmann break her down into the component that most attracts Hoffmann. Presumably Powell shifted Olympia's talent from singing to dance because he would eventually cover the downfall of a singer in the third act, but the simpler explanation is that dance is more visually arresting than singing; in the first major cinematic version of an opera, Powell turns the opera on its head. Martin Scorsese refers to this shift and its influence on the film as "dance as narrative" regarding how dance becomes the primary method of storytelling. But dance is also the form and the subtext of the film, central to any reading of the movie. Note that, compared to Helpmann, Shearer and Massine, Robert Rounseville is the only singer instead of a dancer with an overdubbed voice, and is it any wonder than Hoffmann himself is the least interesting character in the movie? (Note that he doesn't get title billing in the poster.) Even garbed in outlandish, garish purple that clashes with each of the different, alternately colored sets, Hoffmann exists in Powell's mind simply to link the segments and is otherwise unremarkable. Powell and Pressburger move the focus of the film further away from the title character in the second act, where Olympia is replaced by the prostitute, Giulietta (Ludmilla Tchérina), the virgin white of the doll swapped for a seductive black leotard. Bewitched, literally and figuratively, by her magician pimp, Dapertutto (Helpmann), Giulietta steals away Hoffmann's reflection and, implicitly, his soul. * Powell contrasts Giulietta with Olympia is a stunning aside following a fatal duel between Hoffmann and another suitor who holds the key to her bedroom: suddenly, Powell separates the woman from the action and switches her black clothes to a white sari, focusing on her jeweled feet as she lightly walks upon the heads of all the men she'd lured to their doom. In that moment, she transforms into Kali**, the Hindu goddess of time and change who represents both fertility and destruction. The most famous myth involving Kali involves her dancing upon the corpses of the slain on a battlefield; by reflecting her, Giulietta becomes a destroyer through her dance where Olympia was herself destroyed by hers. Hoffmann manages to regain his reflection, but Giulietta is already gone with Dapertutto in a gondola that looks more Egyptian than Venetian, as if the prostitute now becomes Isis and Dapertutto Osiris as they ride off-screen into the realm of the dead. Or perhaps she becomes Persephone and Dapertutto Hades, especially given the use of the Demeter/Persephone myth in the third and final act. Antonia (Ann Ayers) lives on a Grecian island in a home that might wash away at any second but seems as if it will stand forever. Compared to the previous women, though, Antonia cannot express her talent, cursed to die if she ever sings with her angelic voice. The Persephone imagery begins in earnest when Dr. Miracle (Helpmann) arrives, looking not unlike the Grim Reaper (which is of course is the modernized image of Hades but still relevant). Dr. Miracle drugs her in an attempt to coax the young woman into singing, and the drugs give the poor girl intense hallucinations. Her room becomes a massive garden with stone steps, which turn into an endless stairwell in the middle of space as the disembodied voice of Antonia's dead mother coaxes her onto the stage. The entire sequence builds into a frenzy, the initially inviting imagery of Antonia's visions is layered with increasingly unsettling undertones of the dark truth behind her hallucination. And so, tricked by "Death" by the image of her mother, Antonia takes to the stage for her aria (as flames arise to mark her damnation and hands reach up à la Lang's Metropolis), and Hoffmann arrives just int time to see her collapse. As the last piece of Olympia to function was her dancing leg, so too is the last vestige of Antonia's character her voice. Each of the three acts is itself intriguing, but it is the denouement that collects them into a larger intelligence and emotional reward. Lindorf confronts Hoffmann and rips off the various faces of his disguises, bringing each of the related female characters back to life. They then combine into the character of Stella, dressed in white, and suddenly the treatment of these women becomes more clearly a Christ parable. Olympia, Antonia, even Giulietta (who survives but clearly "belongs" to her pimp by the end) are torn apart for their womanhood, yet in their destruction they defeat death, three like figures who combine into one composite figure garbed in pure white. Powell then splits the frame to show Stella dancing with Hoffmann from four different angles, a pas de deux that becomes even more an emotional payoff through its visual duplication. Yet the director clearly stresses the emotion of the shot over the connection with Hoffmann, to whose reality Powell returns via a tableau vivant of the tavern patrons frozen around their drunken storyteller. As in the original opera, Stella arrives to see her admirer too wasted to stand and leaves with Lindorf instead. But Powell and Pressburger omit the revelation of Hoffmann's companion Nicklaus to be the Muse who inspires and loves her poet; when it comes to Hoffmann's denouement, Powell takes the same stance as the rabbi who relates the story of the goyim's teeth in A Serious Man: "Who cares?" But let us consider Nicklaus and the actress who plays him. Pamela Brown was the director's love from the moment they met to her early death at 58 in 1975, and her own story informs many of the elements of The Tales of Hoffmann. Brown suffered from crippling arthritis from age 16 that made acting an excruciating experience, and she could perform only under heavy sedatives. Thus, she is reflected in all three of the women who tempt Hoffmann. Like Olympia, she had to be "wound up" before each performance; like Giulietta, her feet represent destruction (Giulietta's of others, Brown's of herself); and the haze of Antonia and her ultimate self-annihilation visualize the effects of the drugs that allowed Brown to kill herself day after day. When Nicklaus sadly closes the curtain (literally) on Antonia's body at the end of Act III, Brown herself might be looking away from her own future in fear. Powell does not reveal Nicklaus as the Muse because he'd already proved how deeply Brown affected him and influenced his storytelling throughout the film. Look at the end of the second act, when Hoffmann breaks the mirror in Giulietta's room and regains his reflection. Powell cuts to a close-up of Hoffmann in the mirror with Brown just behind, her eyes glowing from reflected light. Though in the background, she draws as much attention as Hoffmann until she slips behind the protagonist, symbolically returning Hoffmann's soul and making a larger statement about Nicklaus/Brown's status as the Muse of the project more than a stated proclamation could convey. That mixture of intensely personal narrative and more bombastic cinematic experimentation in the most grandiose of the older arts marks The Tales of Hoffmann as one of the Archers' great triumphs. Powell's direction is so striking to watch in a time when realism is being paraded about as the surest sign of artistic validation:*** his dancing camera is occasionally limited by the shortcomings of technology, yet the freshness of its movement and staging remains captivating. There is a lightness in Powell's approach, flying in the face of the post-Griffith era in American and British film by clinging to the old bastions of cinematic imagination -- expressionism, Disney, the first forays into special effects cinema at the turn of the 20th century -- a childlike peevishness best typified in the film's final shot, of a stamp that plants a cheeky "Made in England" on the screen. *Remember that mythical creatures without souls, vampires, do not cast reflections. Even in the real world there exists a correlation between reflection as the soul, such as the belief among some that photographs or any form of image capture steal a piece of the soul. **Did Powell and/or Pressburger learn about Kali reading up for Black Narcissus? It's a hell of a stretch, considering they shot the film at Pinewood Studios, but the connection between Giulietta and Kali is too strong to assume that they are unrelated. ***Some realist and realistic films are certainly great, but when did visual storytelling become so out of fashion? Even the more visually sumptuous films floating about the mainstream contain a wide gap between those gorgeous looks and the narrative. I wouldn't necessarily call it one of the Archers' great triumphs, but it's certainly essential viewing. It's an extension of the dance sequences of The Red Shoes, although not quite as impressive, and despite the real-life parallels with some involved, as you noted, it strikes me as more impersonal than true masterpieces like A Canterbury Tale or Black Narcissus. It's also pretty uncharacteristic in its specificness--you noted the similarities between Giulietta and Kali and that's kind of what I mean. P&P made pretty mystical and religious movies, spiritual even (God I hate using that word), but they were deliberately unspecific, and they were pretty critical of asceticism, fanaticism, dogma, not having an intimate relationship with the natural world. Which makes seeing living, breathing gods walking around in Hoffman really, really weird.